Rice: three senior Ireland caps. 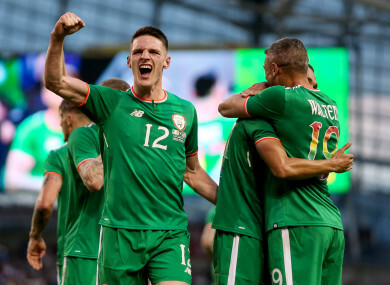 DECLAN RICE HAS told both Ireland and England that he needs more time before making a call on his international future. In an interview with the Times Ireland, West Ham’s teenage defender said that the decision is ‘one of the hardest’ that he will have to make in his career. Rice, 19, represented Ireland at underage level and has made three senior appearances for the Boys in Green — although, crucially, never in a competitive fixture which leaves him eligible to transfer allegiance to the country of his birth. Recent reports indicated that England manager Gareth Southgate had convinced Rice to make an international u-turn but Martin O’Neill remains hopeful that he will commit his future to Ireland. “Without a doubt it is not an easy decision,” Rice said. “It is one of the hardest I will have to make in my career. “Martin was excellent when he came to my house and Gareth was excellent and they both understand the position I am in. I said I just need some time. Email “Declan Rice: International call is one of the hardest decisions I will make”. Feedback on “Declan Rice: International call is one of the hardest decisions I will make”.